July 2012 – Concurrent Technologies announces their latest AdvancedMC™ (AMC) high performance processor board featuring the 3rd generation Intel® Core™ processors. The AM 90x/x1x provides configurable on-board storage in a double-width AMC form factor. With optional support for the MTCA.4 standard, the AM 90x/x1x extends the MicroTCA™ architecture to applications related to physics research. The double-width AM 90x/x1x single board computer features the latest quad and dual-core 3rd generation Intel® Core™ i7 processors along with up to 16 Gbytes of DDR3-1600 ECC SDRAM. By utilizing the 3rd generation Intel® Core™ processors, based on 22nm process technology, the AM 90x/x1x is able to benefit from improved power efficiency and processing performance compared to the previous generation of processors. In addition, the 3rd generation Intel Core processor extends itself to support compute intensive applications by providing support for OpenCL™. The AM-90x/x1x is designed in compliance to AMC.0, AMC.1 Type 8 (x8 PCI Express®, Gen 1, Gen 2 or Gen 3), AMC.2 Type E2 (2 x Gigabit Ethernet) and AMC.3 Type S2 (2 x SATA ports). The board features a range of interfaces including serial ports, USB 2.0/3.0 ports, Gigabit Ethernet interfaces, DVI-D and a DisplayPort interface. Complementary to this, the AM-90x/x1x also offers flexible on-board storage options that can accommodate an on-board flash drive, a 2.5” HDD/SDD and up to two half-slim SDDs. The board can be configured to be SCOPE Alliance compliant and MTCA.4 compatible. 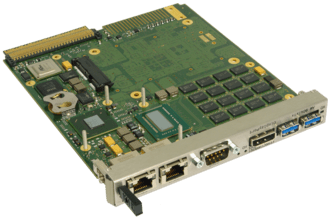 The AM 90x/x1x is designed for use in MicroTCA for Physics applications in physics research market and MicroTCA™ applications in the telecommunications market where flexible storage is required. For ease of integration, many of today’s leading operating systems are supported including Linux®, Windows® 7, Windows® XP, Windows® Embedded Standard 7 and VxWorks®.